I was so honored to receive these commentaries yesterday from a dear friend, whose grandfather was a faithful preacher of God’s Word here West Tennessee for a number of years. There are some real gems here: the American Commentary Series, and B.H. 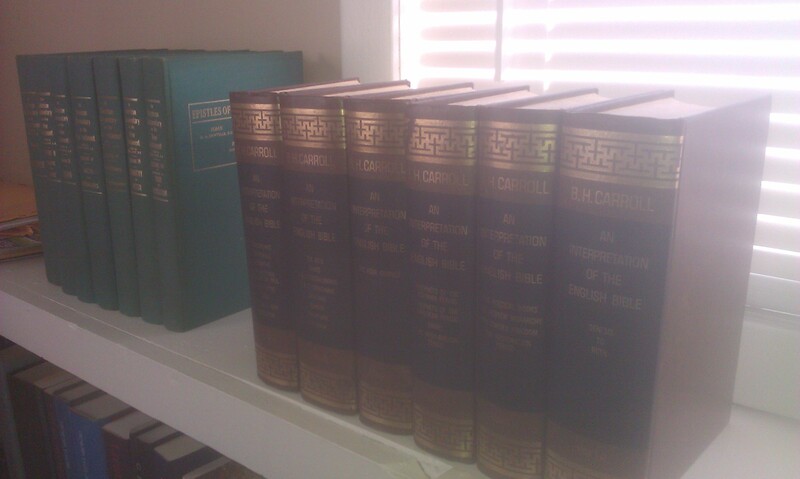 Carroll’s Interpretation of the English Bible, all volumes written by leading Baptist pastor-scholars from the late 19th and early 20th Centuries. I look forward to receiving help from brothers like Carroll, John Broadus, E.T. Winkler, and Hezekiah Harvey, as I prepare future sermons here at Curve Baptist Church. As I use the books, I hope I’ll take a moment to reflect on how the Lord Jesus used them in a former day to keep his promise in building his church, and how he’s still being faithful to that promise today. I’m grateful to God for these resources, for his faithfulness to his people from one generation to the next, and for the deep bond of friendship in Christ these books represent. What a good life he has given us; what a great God he is. This entry was posted in Christian Life and tagged Bible, Books, Friendship. Bookmark the permalink.